Most people who give meditation a try start out strong, meditating every day for a week or two. But as weeks turn to months, every day turns to a few days a week, and then slowly fizzles out altogether. Unfortunately, a sporadic meditation habit won’t do much for gaining calm and clarity, so how can you start meditating more often? Here are three key strategies. We all know about priorities. But when it comes to little things, it’s easy to push them aside for comfort or other seemingly more important tasks. For those who attempt to meditate regularly and fail, meditation is usually one of the first things to get bounced from their schedule when life gets busy or tough. And really, this is exactly when you should be meditating most, as meditation will make it far easier to manage the stress and balance your schedule. So, what do you do? Make meditation one of your top three priorities, or tasks to accomplish, for the day. If you can’t prioritize the meditation habit, none of the following ideas will do any good. Just like with any developmental process, building a habit takes time. It’s a growth process. An athlete doesn’t become an Olympian in a month. A six-year old doesn’t become a man overnight. And you too, shouldn’t expect to become a 20-minute-a-day meditator in a couple weeks. This is why it’s essential to remember to take one step at a time. Instead of aiming to meditate 20 minutes every day from the get go, start out small. Meditate for one minute the first few days. Once you’ve successfully accomplished that, take another step forward and meditate three minutes for a few days. As you continue to consistently meditate on a daily basis, keep upping your minutes. Go to five minutes, 10 minutes and so on. Sooner than you know it you’ll be up to 15, 20, or even 30 minutes on a regular basis. Unexpected plans are a common cause of skipping out on meditation. If you usually meditate when you come home from work, a late night at the office or happy hour with friends can derail your daily meditation practice. Don’t feel bad if this happens once or twice, as even the most experienced meditators aren’t immune to skipping out on a session every now and then. However, while missing meditation a few times a month won’t do much for disrupting your increased calm, regularly missing it several times a week will. The solution? Meditate in the morning. If you meditate before you go to work, there’s absolutely no way any unexpected plan is going to disrupt your practice. While these three tips will help you create a regular meditation practice, it’s also important to think about why you want to meditate every day. In other words, think about those awesome benefits you get from a regular practice—calm, clarity, and gaining a better sense of direction in your life and career. Let these be the motivating forces behind your daily practice. Remind yourself of them often, and you’re much more likely to reach your goal. 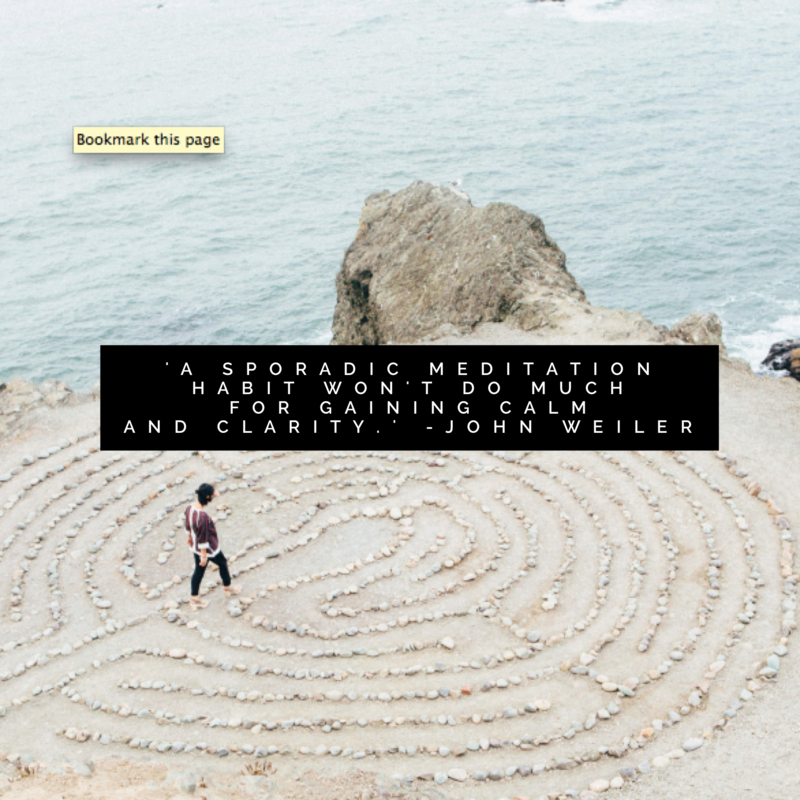 John Weiler is the author of An Ordinary Dude’s Guide to Meditation. Learn more at his website Ordinary Dude Meditation or follow him on Facebook. When I decided to walk in the early morning I tried to woke up at 5:00 am first. Strike against my mind, still want to sleep in the bed. My target was to walk 1 hr per day. On the first day the the 30 minutes seem difficult for me. But after a month it become easy to walk 30 min per morning. Then increased the duration of walking time to 45 min and at last to 1 hr.Now I am walking 1 hr easily, per day. So your article lights me the way to start meditation. I will start 5 min of meditation per day. Thank a lot for your guide.